Zari arrived at 1:00am in black Lincoln Limousine. Platumz's brother, Romy Jons and Dj Zinhle, a top South African DJ joined Zari for a brief photo session amidst wild cheers from fans. Prince MJ who replaced Ivan Semwanga in the Rich Gang Group came cruising with Zari in the Limo. She looked understandably tired considering that she had been visiting several radio and TV stations in the last few days to drum up support for her party, the fans did not disappoint, they came in large numbers to extent of denying some entry. The mom of five knows how to play with her hair extensions, but she just put a simple hair piece this time around, but it looked good on her. Navio and Talent Africa's CEO Aly Alibhai were also right by her side when she arrived at Guvnor. Shortly after the brief photo session, Zari made her way to Guvnor, many tried to tag along in the process, but were pushed by the mean Zari looking bouncers who at hand to ensure that all was well. Before Zari's arrival, Spark TV was covering the event, most of the guests especially female, were camera shy, they kept on running away from the cameras and one who allowed to be interviewed had this to say; 'The party is (mavaras)..Marvellous and when they told her that you are smart, she was like; "Riiri...Really"
The cameras turned to the guys who ar Ba-Summer's from South Africa, they were armed with South African Rands and wondering if they would allow them to spend in Rands while in Guvnor. It was drama when one of them dropped a 100 rands note which is less than 30k Ugx, he rushed to pick it lest it disappears. Inside Guvnor, fans were busy dancing to music as DJs Romy Jons and Zinhle did their thing, taking selfies with Zari and also recording her vids as she danced with the fans was the order of the night. 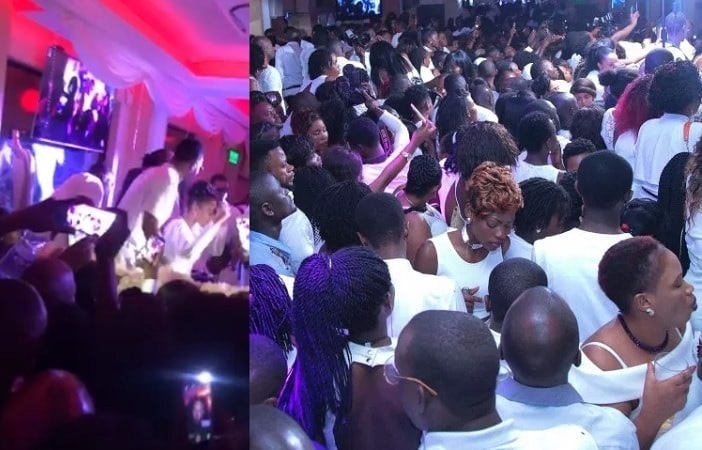 Zari fans are now looking forward to next year's All White party. On the other hand, Don Zella's first Gal Power Party was well attended considering it was the first edition. 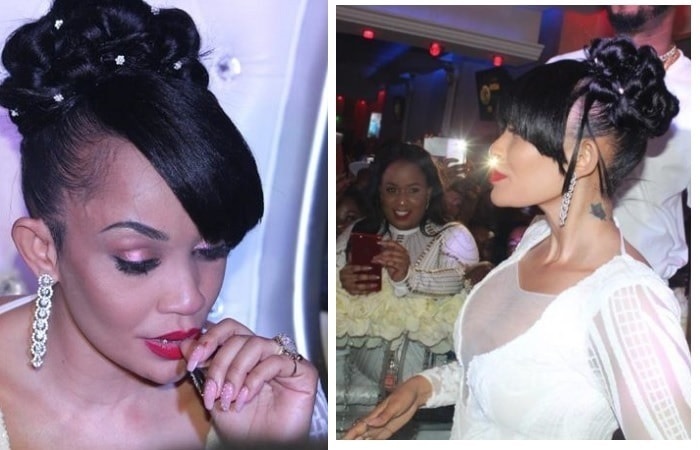 Her only troubles were with Spark TV with whom she signed a contract to only cover her event, but to her dismay, they also covered the Zari All White Party. Spark TV's Anatalia Oze was smartly dressed in her pantyless red outfit busy covering the Gap Power Party while her co-host, Zahara Toto was covering the Zari All White Party where she got some rands from some excited SA BA Summer's, she wanted them to unleash, but 'wapi', they were done. 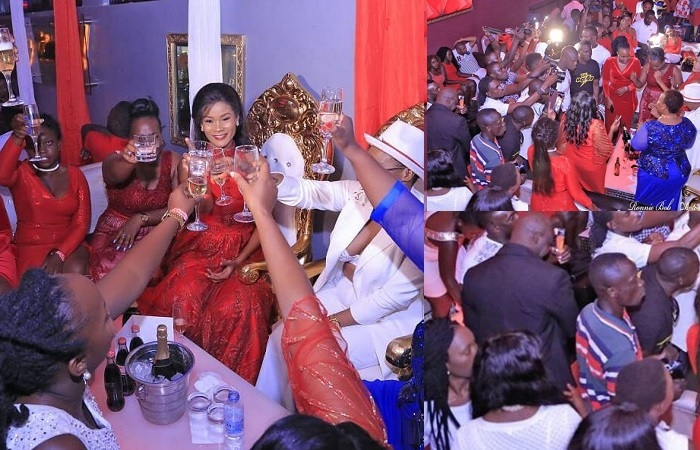 Hamisa Mobetto, Sheila Don Zella and Mama Phiina raised their glasses to a successful party. They also say this part that aims at empowering single mothers and the less privileged will be taken to Tanzania and other African countries. In conclusion, it was a draw considering that the All White Party has been around for six years and this was Don Zella's first.